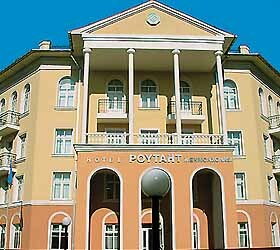 The Poytaht Hotel occupies a four-storeyed building located in downtown Tashkent surrounded by tourist attractions, parks, and architectural relics. The hotel offers accommodation in 112 rooms, including 54 Single, 49 Double, 3 Junior Suites, and 6 Suites. Each room is air-conditioned and equipped with international telephone communication, high-speed Internet access, satellite television, and minibars. The Poytaht Hotel is well-equipped for hosting business meetings, seminars, conferences, and cultural occasions. The big conference hall accommodating up to 150 guests may be equipped with audio and video facilities: an LCD projector, simultaneous translation equipment, laptops, etc. Catering service, including coffee breaks, lunches, and dinners, is available. The hotel also offers Forum, Dialogue, and Panorama conference halls. The hotel's business centre is outfitted with up-to-date office facilities: high-speed Internet access, computers, a printer, a scanner, a copying machine, telephones. The Bliss restaurant serves European and Oriental cuisines. It offers banquet service and catering for wedding parties, family celebrations, and corporate events. The Royal bar located on the ground floor of the hotel offers a fine assortment of alcoholic and soft drinks. The Viva bar serves a variety of original cocktails. The bars and the restaurant are open round-the-clock. The Poytaht Hotel also offers the following facilities and features: a guarded parking lot, a souvenir boutique, currency exchange, an outdoor swimming pool, air tickets booking, Wi-Fi Internet access, and billiards.